CEDAR FALLS - Doris June Baldwin, 86, of Cedar Falls, died Monday, Nov. 16, at Sunnycrest Nursing Center, Dysart. She was born June 7, 1923, in Vernon County, Wis., daughter of Guy and Pearl Miller Williams. She married Harold O.“Harry” Baldwin on Dec. 9, 1943, in La Crosse, Wis. He died May 3, 2007. Mrs. Baldwin attended two years of college and was a receptionist in La Crosse during World War II. After moving to Cedar Falls in 1964, she was employed with Price Lab and UNI for 21 years. 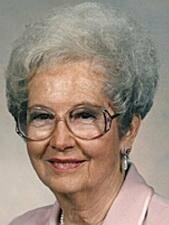 Doris was an active and faithful member of First Baptist Church/Prairie Lakes Church for more than 40 years. Survived by: two sons, Craig S. (Jane) of Broken Arrow, Okla., and Mark W. (Peggy) of Cedar Falls; a daughter, Lisa A. (Francis) Wheeler of Broken Arrow; six grandchildren, Laura (Nick) Hawkins and Jared Wheeler, both of Broken Arrow, Sarah (Jason) Lindner of Norwalk, Conn., Amy (Andy) Schmidt of Hovland, Minn., Emily (David) Cervantes of St. Louis Park, Minn., and Julie Baldwin of Cedar Falls; and a great-grandson due in February. Services: 2 p.m. Thursday at Prairie Lakes Church, with burial in Cedar Valley Memorial Gardens. Public visitation from 12:30 p.m. until services Thursday at the church. Richardson Funeral Home is in charge of arrangements.